Aomori City, Japan (CNN) – Twenty-one feet of snow – enough to bury a two-story house. And then some. That's how much snow fell last year in Aomori City, in the northern Tohoku region of Japan. But it was just another winter in this coastal city that's home to nearly 300,000 people. Every year, this northern prefectural capital is pummeled by heavy blizzards and ice storms, making Aomori one of the snowiest major cities on the planet and an intriguing travel choice. The extreme snowfall is caused by chilly siberian winds that sweep into japan from the northwest every November. As the cold air crosses over the warmer waters off Japan's mountainous coastline, the gathers moisture, then rises and turns into snow. And lots of it. Aomori City has received more than eight feet of snowfall already in the first months of this year. Trucks haul excess snow to an Aomori port, where it's dumped into the sea. Japan's so-called "sea-effect snow" leaves much of Aomori City and its surrounding suburbs blank in a thick layer of powder during winter. The ground is almost completely white until April. Roofs are covered. Sidewalks are obstructed. Many of the streets downtown are defined by walls of packed ice that are counting each time snow plows attempt to clear the way. Julia Minatoya grew up on the outskirts of Aomori City. The snowdrifts in her backyard are so big each winter that she can use most of the doors or windows on the first floor of their home. "It's a constant battle for every single day," she says, snow shovel in hand, as fresh dump snow on the driveway she's just cleared. Furukawa, Aomori's central market , offers some of Japan's best seafood. Despite the constant blizzards, Aomori City doesn't close down in the winter time. On the contrary, it transforms into a winter wonderland for skiers and other tourists looking to frolic in the snow. Many visitors come to sample some of Japan's freshest and best seafood. Vendors sells it in bulk or by the piece at Furukawa, the city's central seafood market. The local specialty is cams, a rice bowl with a variety of toppings – such as raw tuna, octopus or sea urchin – which you select from different stalls. An onsen ryokan – Japanese hot spring – on Aomori's Mt. Hakkoda. "The best season for fish in Aomori is wintertime, especially codfish, with many coming to these waters for harvesting," says Yone Natsume, a fishmonger at Furukawa. For powder hounds, the nearby Hakkoda mountains offer some of the wildest backcountry slopes in the world. American Tim Roberts recently traveled here from the United States with some friends. The group spent several days snowboarding down both groomed and youngroom courses on Hakkoda. "This place is a little different because there are very many runs in the mountain. It's a real kind or choose-your-own-adventure, find your own path," he tells CNN Travel. Aomori's Mount Hakkoda is a popular ski destination. Traveling to Aomori City is not difficult, even when it's snowing. It's a three-hour ride from Tokyo on Japan's high-speed bullet train. Or you can fly into the city's main international airport, located on a mountain above town. Aomori Airport handles some 20 flights a day. It's possible to land and take off there even in the winter because of the airport's massive snow removal team, which calls itself White Impulse. heavy snow plows several times a day in order to keep the airport's single landing strip ice-free during the worst winter weather. In over two decades of operations at Aomori Airport, no flights have been delayed or canceled due to snow on the runway, says Daishuke Saito, a snow remover with White Impulse. "When I see airplanes landing and taking off safely because of what we do, it makes me proud. It's a real feeling of accomplishment," he says. 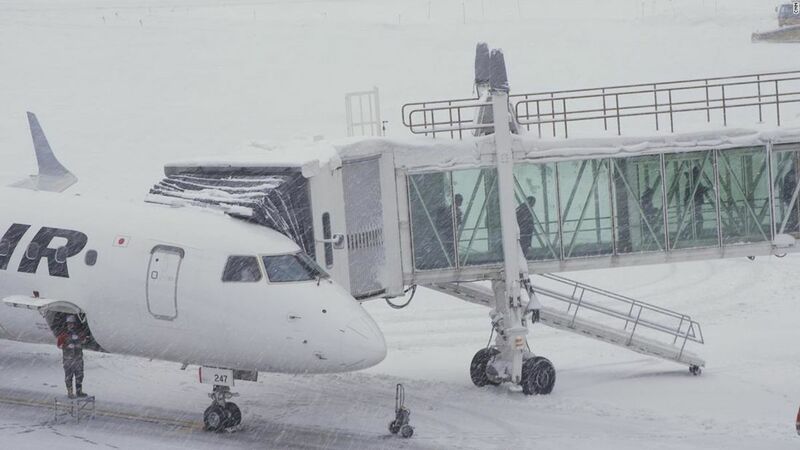 In spite of the snow, Aomori's airport handles about 20 flights a day. Of course, removing snow from the runway and roads around Aomori City only solves part of the problem – it has to go somewhere. To prevent buildup, flatbed trucks haul excess snow to the port along the city's northern Mutsu Bay coastline. There, it's unloaded into the sea. The trucks operate all day, every day. Last winter season, the snow removal operation in Aomori City cost $ 35 million, according to local officials.